William Katt plays Roger Cobb, a popular horror novelist who is dealing with a missing son, an estranged wife, a dead aunt and writing about his experience in Vietnam. After moving into his aunt's old house, he begins to have terrible nightmares and see awful things roaming around the house. The most frightening spectre is that of 'Big Ben' (Richard Moll), an Army buddy who met a bad end in Nam. 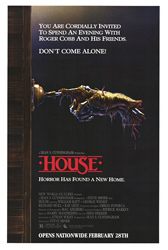 From the plot description alone, 'House' sounds like it would be a pretty grim movie, so it's a surprise how really light and comedic it becomes. The first half hour or so, is mysterious and eerie but the film settles into plenty of comedic moments with George Wendt as a clueless neighbor, an elusive severed hand, and some rouge garden tools. It tries to pull everything back into horror at the climax and almost succeeds thanks to an especially menacing performance by Richard Moll, which is no doubt helped by some wonderful zombie make-up. The crazy thing is that Dekker wrote this AND wrote and directed 'Night of the Creeps' in the same year. That's talent. When Dekker is on, he is fantastic.